Finding and implementing good performance metrics is a tough task. There are some good examples of simple metrics, but when it comes to something less tangible the task to find a good indicator looks like an impossible one, but actually it is not. This system is a step-by-step approach to find and deal with the most challenging metrics. The next time you need to track someone’s performance, estimate the quality, or analyze the value created, use this time-proven system to come up with good indicators and improve existing ones. The system consists of 12 steps. Make sure you have carefully reviewed Steps 1-3. That’s your basis for dealing with challenging metrics! 1. Decomposition. What is the Subject of Measurement? Let’s take a difficult subject to measure, like for example “quality.” From the first look it is intangible, and is not measurable, but let’s do a short exercise and try to define what is “quality,” for example, if we are talking about the quality of a software. The same decomposition exercise can be done with other intangibles like “value,” “performance,” or “engagement.” For more examples and various statistical tools check out the books by Douglas W. Hubbard from “How to Measure Anything…” series. If you want to follow up with the topic of quality, I do recommend for you the full guide into Quality KPIs and Scorecard. 2. Stakeholders. Who Has an Interest? Stakeholders are any person, group or system, that have or we want to have an interest in our project. 3. Context. Why Do You Measure? 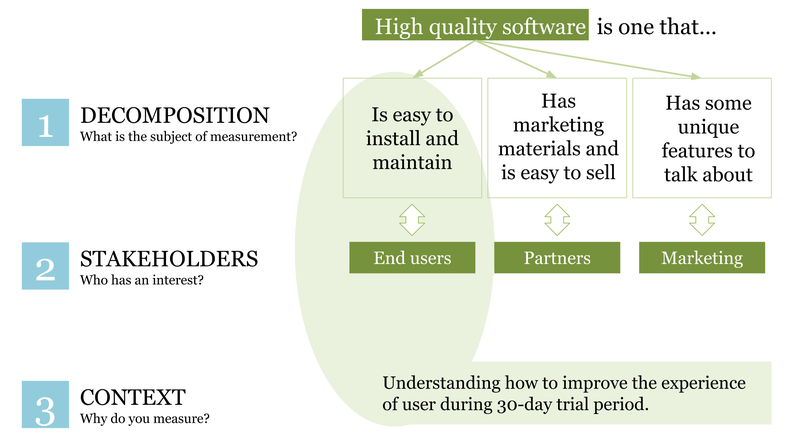 We want to measure software quality in order to understand how to improve the experience of user during 30-day trial period. 4. Mental Traps. Blind Spots and Uncomfortable Metrics. We are all human beings, try to detect and avoid some typical “mental traps” that happen when we are looking for new metrics. If there is no goal that stands behind the metric, then this metric is useless in a business context. Remove it from your scorecard! Why don’t some of your goals have any metrics aligned with them? Let me guess, because it’s hard to find good metrics! The real reason is because the goal is not yet well defined. To define a big goal break it down and focus it as we did in Steps 1-3 for “immeasurable” software quality. Many read the previous section and decide to add some metrics to the goal in order to “pass the test.” If that’s your case, you are at risk! By adding easy to measure, but low value metrics you solve the problem temporarily; however, more valuable metrics stay unnoticed. There are always some inconvenient metrics that people tend to ignore because they will bring too much of the red color to their nice scorecards and dashboard. For example, you know that the localization of the software in Chinese language is something outdated, so if you put a “Localization coverage, %” indicator on your dashboard it will be in the red zone for a long time before your team fixes it, so you decide simply… not to do that. What would be a better approach in these cases? If the answer is positive, then you can take it into account when prioritizing the business goals (see Step 8: Sorting metrics). Are there exceptions that cannot be easily quantified? Sure, there are! Sometimes the cost of measurement is too high compared to the value of measurement. If that’s the case, go to Step 6. Unknown. 5. Bird’s-Eye Look. 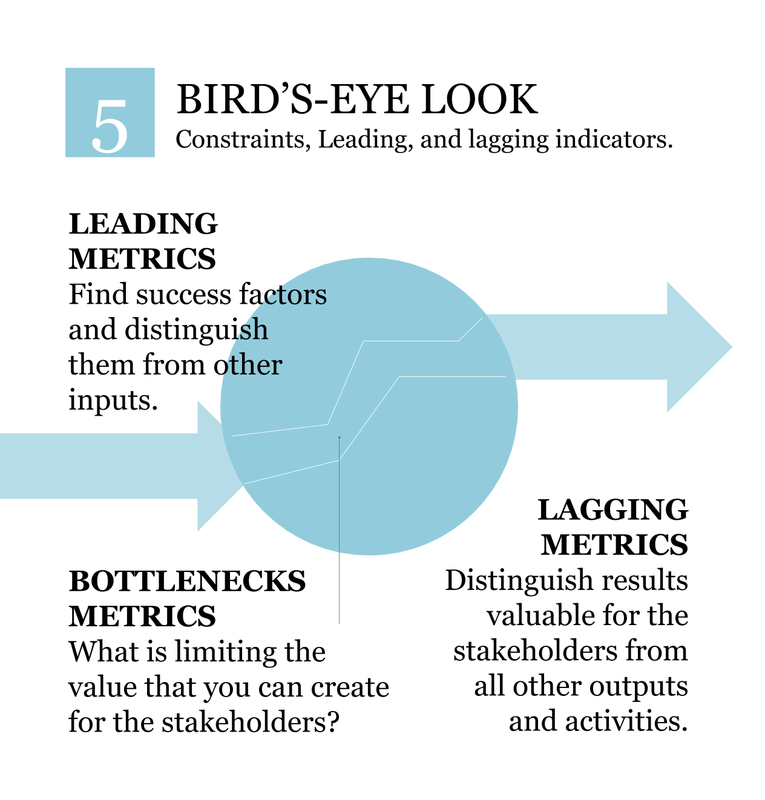 Constraints, Leading, and Lagging Indicators. By talking about metrics in a business context we can define leading and lagging metrics. Lagging metric is the one related to the results that are valuable for the stakeholders. What is a leading pair for your lagging indicator? What is a lagging pair for your leading indicator? Look at the results from stakeholders’ point of view and distinguish valuable results from all other outputs and activities. Learn more about Leading and Lagging indicators in this Q&A article. Have a look at the business challenge once again. What is limiting the value that you can create for the stakeholders? Skip the obvious ones – time and money. The answer to this question will lead you to some good metrics related to the stakeholders’ value. 6. Unknown. Is There Something That You Still Cannot Measure? Sometimes you do the break down step, you know the stakeholders, you define the context, but it is still not clear how things work, and respectively, how to quantify and measure them. Have a look at Cynefin Framework. Most likely your case belongs to the “Complex” area. What can you do in such cases? You have several options. Don’t underestimate the power of simple observation. Most of the astronomical discoveries were made by observation only, no direct measurement, no physical interaction with the subject of measurement (except probably capturing the reflected light). When talking to our clients over Skype we get a lot of interesting ideas by just observing their reaction, for sure your team needs to be able to read between the lines. In one of the stories about Sherlock Holmes the dog did not bark and that led Holmes to the conclusion that the evildoer was recognized by the dog (here is a longer story). In astronomy you cannot observe the black hole directly, but you can observe it indirectly via its influence on matter nearby. 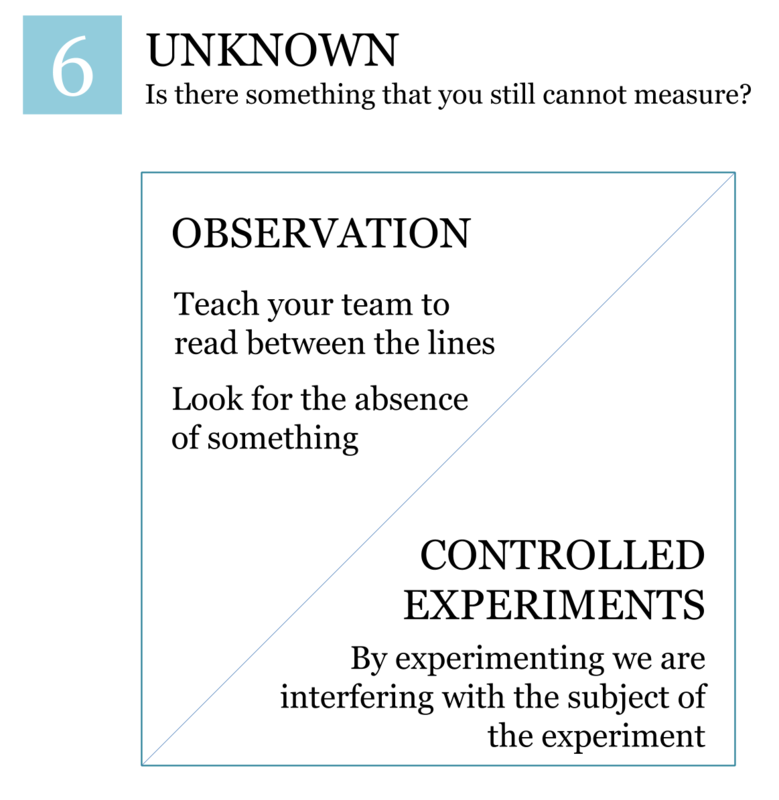 The next step is the controlled experiments. Do what scientists do: establish certain conditions, see how your stakeholders will react, analyze, make the conclusions, and repeat the process again until you have a good understanding of what you need to do to satisfy the interests of the stakeholders. One thing to keep in mind: by experimenting we are interfering with the subject of the experiment, and this might have an influence on the results of the test (in quantum mechanics this is known as Heisenberg uncertainty principle). 7. Metric Setup. Scale, Formula, Weight. Let’s say we measured the easiness to install the software, and we found out that on average it takes users 2 minutes 15 seconds to download, install, and run the software for the first time. How long does it take to install software of the competitors? How long did it take to install our software in the past? What installation time do users recognize as “fast” and what does “too slow” mean to them? What do you want to do with the value of the indicator? Do you want to maximize or minimize it? What’s our case? The lower the value of the indicator is the better the performance is? In this case we obviously want to minimize the installation time. Should we analyze logs of the software? Whatever method is used there should be a clear step-by-step algorithm (better to use a formula) to get the required value. This question doesn’t make any sense. We cannot answer it, as measurement units are different (“minutes” and “visitors/day”). To answers questions like this we need to normalize the values according to some type of scale and calculate the performance in %. We can calculate the performance of this indicator in %: it is 100%*(5-2,15)/(5-0)=57%! This step is optional if you have just a few indicators and their importance (strictly speaking of the importance of the goals that indicators are aligned with) is more or less the same. In the opposite assigning weights to the indicators is a good idea. The weight of the indicator should tell us how the performance of this indicator contributes to the performance of the system. Writing a quick answer to the email is easy (contributes to “Time to answer” metric); but it is more important to give a high-quality answer (contributes to the “Response quality” metric). To reflect this idea we might want to assign a 20% weight to the “Time to answer” indicator and an 80% weight to the “Response quality” indicator. Then these weights can be used to calculate the performance. You can try BSC Designer software for this purpose. Change the weights of the indicators and note how the performance of the container indicator is changing respectively. The reasons and other recommendations were discussed in the KPI Q&As article. 8. Sorting Metrics. How Do You Prioritize Indicators on Your Scorecard? Some that are good to keep an eye on, but are not that important for your department? First of all, it makes sense to review your business context once more (Step 3) and divide the goals into “operational” (those that imply improving on the best practices) and “strategic” (those that are change goals). The difference between strategic and operational was discussed here. 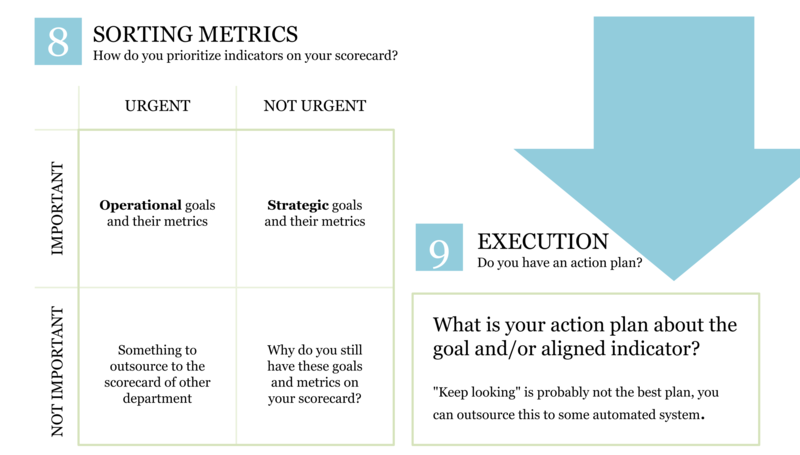 Not important + Not urgent: why do you still have these goals and metrics on your scorecard? This matrix is not perfect, but it is a good starting point. 9. Execution. Do You Have an Action Plan? The performance measurement should be followed by the performance management. What is your action plan about the goal and/or aligned indicator? “Keep looking” is probably not the best plan, I’m sure you can outsource this to some automated system. Have a look at the steps of the system that we had in the beginning. You agreed that this indicator is here for some purpose, so make sure that there is some tangible form of that purpose (=action plan). 10. Impact. 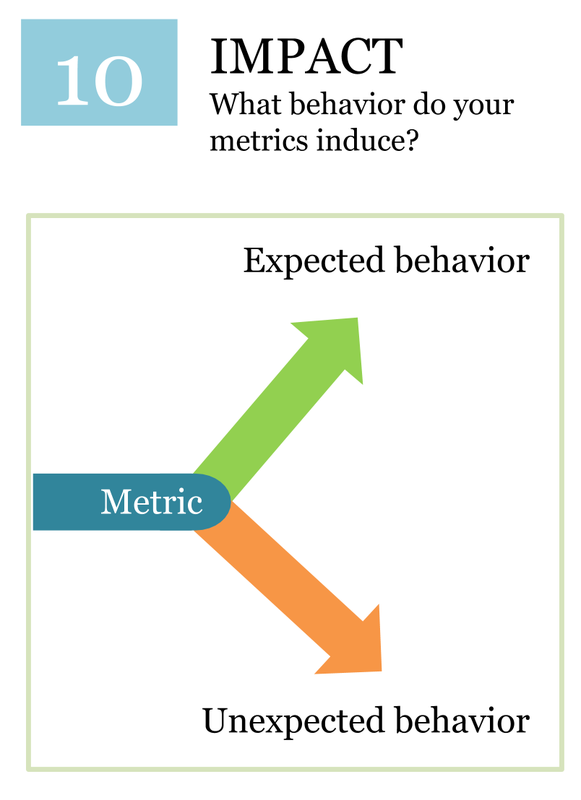 What Behavior do Your Metrics Induce? An international corporation had a goal – keep their employees healthier. Healthier employees mean less days off, and better productivity. The technical solution was quickly found: they gave everyone a wearable fitness tracker. What gets measured gets improved! Doesn’t it? To improve even more they decided to run a competition between several office teams. They were supposed to wear fitness trackers and count the number of steps they do daily. The team with more steps wins. Great! Isn’t it? In practice many participants simply attached their tracker to their dogs in order to game the system and get a higher score. Was the initial goal achieved? Not exactly. The main point: from time to time review your metrics to see what behavior they actually induce. We talk more about KPIs misuse and share more cases in this article. Very often the problem is deeper that just one wrong metric. It is always good idea to look at the behaviour patterns (=culture) that lead to the undesired consequences. 11. Cost vs Value. How to Decrease the Cost and Increase the Value of Measurement? As it was mentioned before finding high-value metrics usually costs more that using low-value metrics. Here we discuss how to maximize the value and control the costs. You can significantly reduce the cost of measurement if you think about the measurement beforehand (see the Step 11.3 Measurable by design). What about the value of measurement? People tend to focus on what is easier to measure. Why should one bother about measuring the quality of customer support (takes effort to measure) when it is so easy to track the “Time to response” metric?! 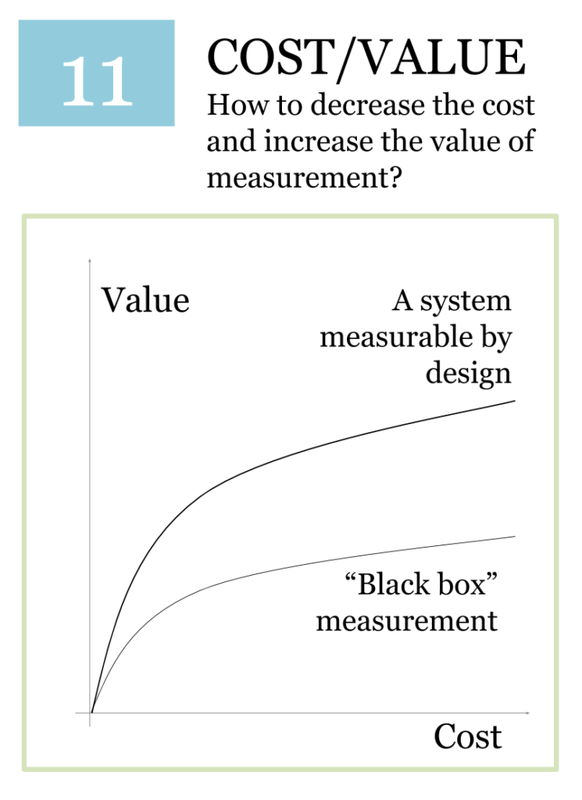 Consider the cost of measurement from the prism of stakeholder’s value. What metric will bring you closer to making your stakeholders happier? What’s the value of the measurement? 11.3. Control plan. Make systems measurable by design. Imagine that you plan to attend a trade show with your product. How would you estimate the success of your participation? That might work for a smaller organization, but in larger companies due to the long decision-purchase cycle the results will be blurred over the time. Key question to ask: what changes can you introduce into your system today to make it easier to measure the results tomorrow? With a trade show example: suggest to all attendees to pass a free self-assessment test (automate it with a smartphone or a tablet). Those who participated will be your hot leads. Not only will the results be more tangible, but your colleagues from sales will have better leads to work with. 12. Automation. Will You be Notified if Something Happens? The last, but not the least. Updating and tracking your metrics manually rises the cost of the measurement (see Step 11) significantly. It is fine if now you use MS Excel, it works great in the prototype stage, but when the scale of the measurement changes, get a professional tool. If you need an example of how one can possibly use this system in practice, have a look at this article. 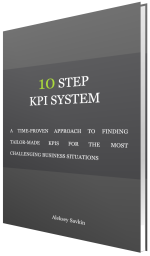 Find some additional guidance in the KPIs Q&As article here. 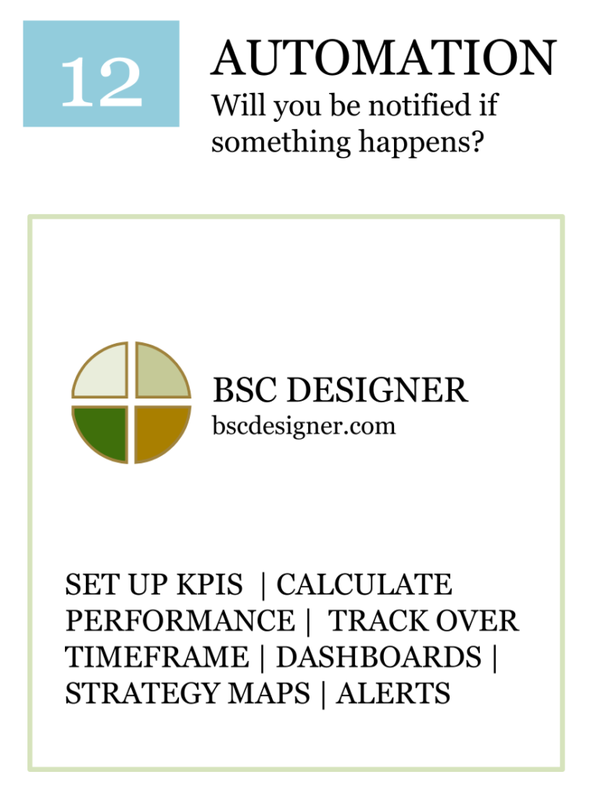 On bscdesigner.com you will find some specific examples of strategy scorecards with some relevant KPIs. 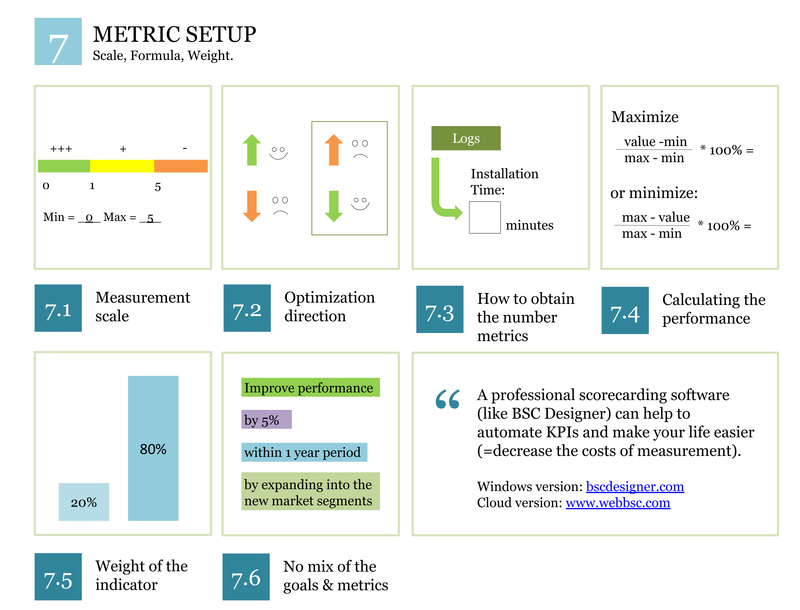 The first formal version of the KPI System appeared in 2014. It included 10 steps and a nice-looking one-page diagram that helped teams to brainstorm difficult cases. The next version included 12 steps: the additional steps were an explicit formulation of the breakdown, stakeholders, and business context steps, but very soon it appeared that the three separate steps looked nice on paper, but in practical use they did not make any sense. 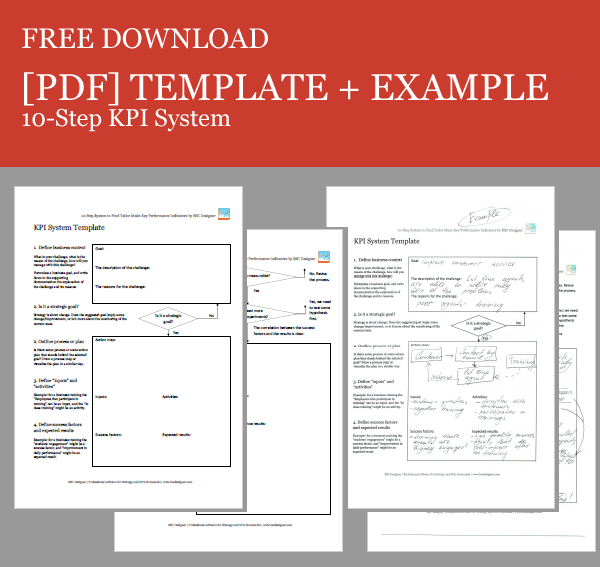 In the current KPI System you will find Step 1 with an introduction to these three concepts, all the supporting ideas are illustrated by the examples. I found that this form works much better for the readers. I want to subscribe to the KPI System Template mail list. By submitting the data via this form, you give your consent for the processing of your personal data including your email for the purpose of sending your email newsletter. Your consent can be withdrawn at any time. Feel free to share your thoughts and ask your questions in the comments. Check out the training video for KPIs function in BSC Designer or try the software right now.